Her name is “Miata” and she isn’t just another pretty face. There are few cars that this driver eagerly awaits as he knows sooner or later he’ll get to drive each and every one sent his way. But the Mazda MX-5 Miata is something else — a long-admired, but often spurned beauty from one of Asia’s smaller automakers. The Miata has been around for 25 years, but for some unexplainable reason this guy never drove one let alone has he ridden in one. Strange, indeed. That all began to change one frigid January afternoon when a candy apple red model with a soft, black roof pulled into my driveway. The Miata’s arrival wasn’t perfect as a winter storm was soon to clamp down on my area. And when that happens, nearly everything shuts down, including my ability to take this roadster on the highway. Nevertheless, with time certainly not on my side, I managed to get my photos done and complete a 50-mile initial drive composed of multiple loops punctuated by sharp curves and dominated by open expanses. It was much too cold to drop the roof, but a fun drive was had nonetheless. 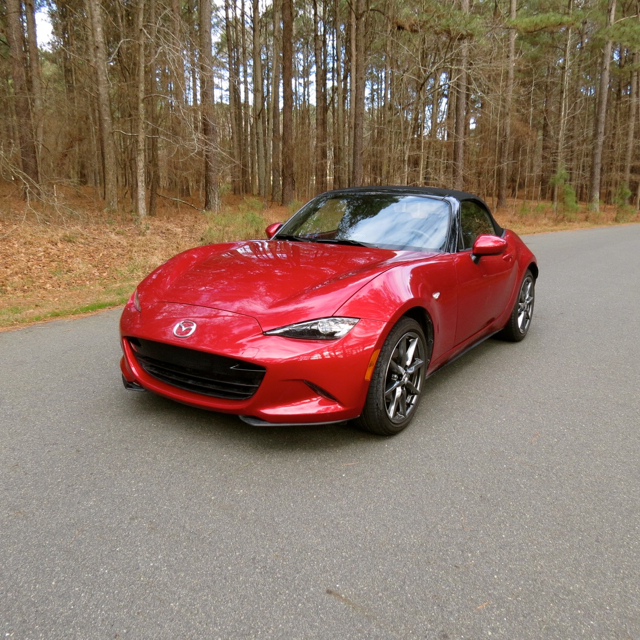 The Miata’s drive comes by means of a high-compression, 2.0-liter, four-cylinder engine making 155 horsepower and 148 foot-pounds of torque. Don’t allow those modest performance numbers to detract from this vehicle. 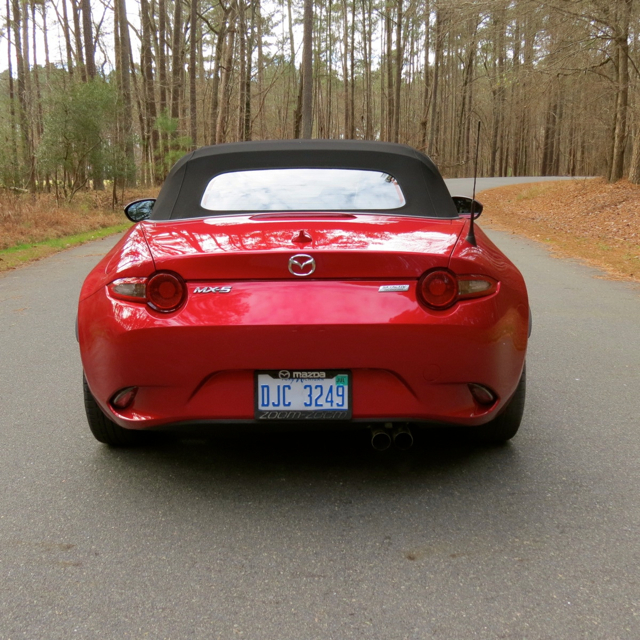 Weighing just 2,332 pounds, the Miata’s engine choice is wholly suited to the model at hand. 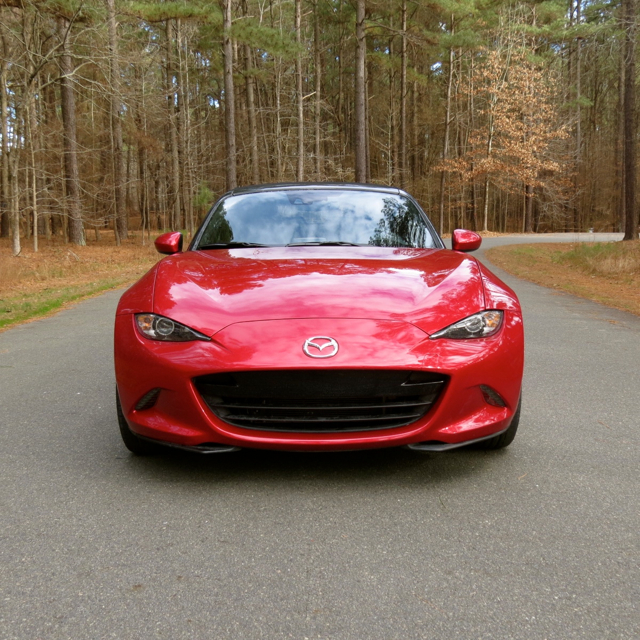 Mazda gives Miata fans a choice of two 6-speed transmissions — manual or automatic. Fortunately, the test model came with the manual, my preference for gear shifting. Although “roadster” and “slush box” seem like a contradiction, let’s face it: there are plenty of Miata fans who prefer automatics as they work their way around town. For them, it is the look that matters most — from the roadster’s sensuous front fascia, across the curvilinear lines defining her profile and on to the tight rear deck. Forgive me for comparing the Miata to a person, but it wouldn’t surprise me if a Japanese model served as inspiration for the designers. One of the first things I had to get used to in the Miata was its snug cabin. I’ve driven the Corvette Stingray, Jaguar F-TYPE and the Porsche Cayman, but nothing else matches the diminutive Miata in cabin intimacy. Still, my near 6-foot frame fit with just a couple of inches left to spare for my knees. Otherwise, expect your knees to press against the roadster’s bulkhead or what’s better known as the lower portion of the dashboard. Once you’re safely ensconced inside, take note of your surroundings. There isn’t much on hand, but what is present reflects a carefully laid out and constructed design with not a square millimeter to waste. The instrument panel is a three-analog display — the tachometer resides in the middle, the speedometer is to the right and an oil pressure/fuel gauge along with a digital driver readout is on the left. At the top of the center stack — in the Grand Touring edition — is a color display for the telematics system. Beneath that are large knobs for the climate control system followed by seat heating switches and an open area for a smartphone. Also on hand is a 12-volt outlet, one USB port and an auxiliary audio input port. Storage is, of course, very limited — owing to this model’s close-fitting footprint. 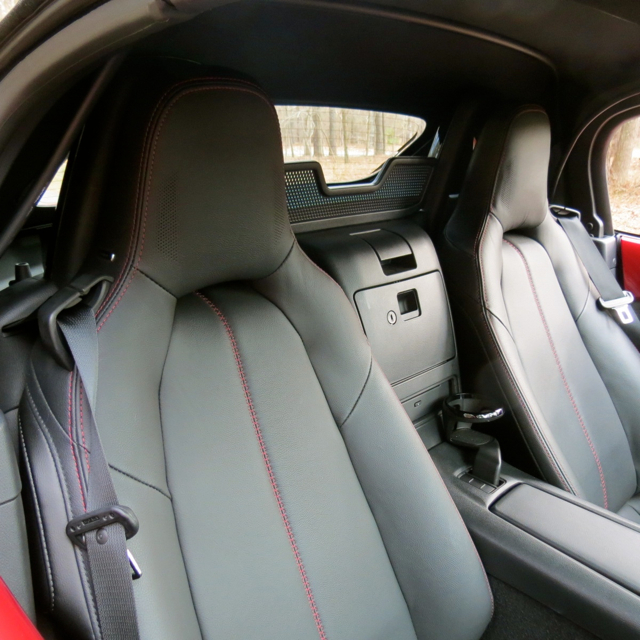 The Miata comes with two removable cup holders, a locking rear center console, as well as a driver and passenger back panel covered storage compartment. The trunk is tiny, but large enough to hold a pair of weekend bags. 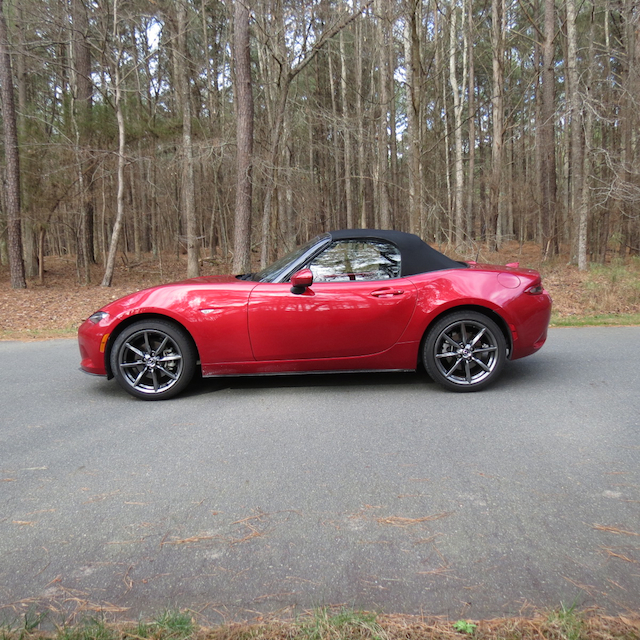 You’ll definitely need to consider taking something else if the gear is an issue — then again, the Miata is worth taking sans gear especially if the weather is lovely. You get a quick shifting, short-throw gear shifter in the Miata. Although the Miata doesn’t pretend to solve your need for speed, it does an excellent job of steering, handling and delivering pep. As you might expect, you won’t find a quiet environment inside — lots of wind noise comes in, but that’s what makes this model entirely captivating — you’ll feel connected to the road just as you would in a sports car costing at least twice as much. If you’re the type of person who waxes nostalgic, you may agree that the Miata offers a spiritual connection to the best British roadsters of all time, such as the Austin Healey Sprite, Jaguar XK-120 or the Triumph Spitfire. The good thing is that this very 21st century roadster hasn’t gone crazy with safety features that may detract from the drive — lane departure warning, blind spot monitoring and rear cross traffic alert are available. But not at the expense of the drive. You may expect every automotive reviewer to give you a sense of how a model handles and I’ll tell you that the Mazda does so nearly perfectly. Its low center of gravity, a 53-to-47 front-to-rear weight distribution, light weight, and nimble handling conspire to serve up the thrills. As soon as you realize that this model is nothing about G-inspired performance, but everything about the tour, then you’ll appreciate its place in contemporary autodom. Take to the twisty roads and this model shines. Its suspension skews to the softer side with only token body roll as you lean into each curve. The feeling is akin to pushing into each turn and maintaining a connection to the pavement thanks to the roadster’s double wishbone suspension. Grip stays consistent throughout and its playfulness is never absent. Alas, the top was never dropped on the test model as two inches of ice coated the car until the day before it was retrieved by the distributor. But I did manage to get in a second drive, one composed of a 125-mile out and back excursion to NC’s golf nirvana — Pinehurst. Although my top down dream was never fulfilled, my time behind the wheel of this quintessential global roadster certainly was — the perfect halo car for the zoom-zoom brand. 2016 Mazda MX-5 Miata photos copyright Auto Trends Magazine.